Pharmaceuticals are wonderful. They are biologically active compounds that are designed to have a therapeutic effect on the people who take them. Yet these wonder compounds, often fueled by years of research and clinical trials have a dark side and one that is often over looked. When consuming medications, the body does not always utilize the entire dose and consequently we excrete, typically via urine, small concentrations of the unchanged parent compound or a biologically active metabolite. In many countries around the world our wastes are processed by waste water treatment facilities, however, they are not equipped to remove drugs from sewage and are consequently released into waterways. Aging infrastructure, leaking septic tanks and sewer overflows also contribute to this problem. While landmark studies such as Kolpin et al 2002 identified drug contamination in waterways specifically water samples, very little was known about their presence and persistence in aquatic food webs. 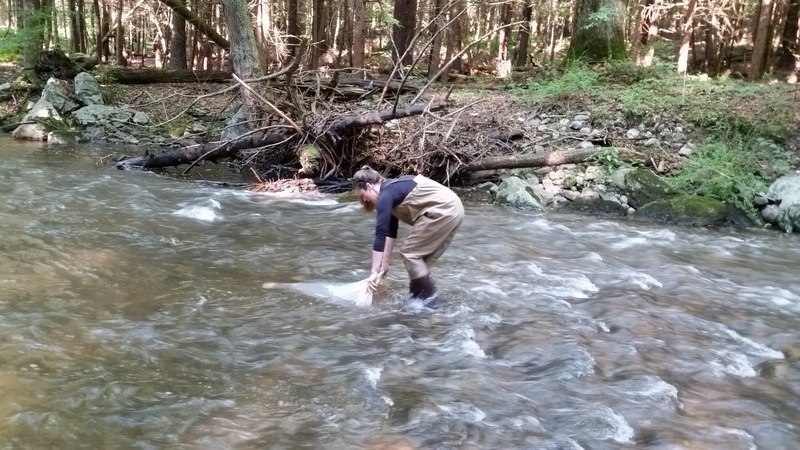 Emma Rosi, Michael Grace and I began to examine the effects of pharmaceuticals on streams and the insects that live within them, finding out that common drugs can influence aquatic insect emergence and alter rates of primary productivity within streams. But the questions still remained: Do drugs accumulate and move through aquatic food webs? What are the implications for predators living in streams? We set out to answer these questions in our recent paper published in Nature Communications: A diverse suite of pharmaceuticals contaminants stream and riparian food webs. The approach was reasonably simple: select sites with various waste water signals, as we know that waste water is a direct source of pharmaceutical contamination, and collect aquatic invertebrates and riparian spiders to test for pharmaceuticals, assemble an international team of researchers with complementary skills. As freshwater ecologists, collecting invertebrates and riparian spiders was simple; the difficult part was working out how to extract pharmaceuticals from the 100's of bugs and spiders. Coincidentally, Jerker Fick, a pharmacologist and analytical chemist from Umea, Sweden was visiting Monash University and after listening to his talk at a symposium I immediately jumped at the chance and asked if Jerker would like to work with our team. The result of this encounter was that over 200 insect and spiders could be analysed for almost 100 different pharmaceutical compounds. The largest data set to our knowledge. Upon receiving the pharmaceutical analysis results it was clear that we had begun to answer our questions. Yes there were drugs in bugs but perhaps the most exciting part was that there were clearly drugs in riparian web building spiders – these guys feed almost exclusively on emerged aquatic insects! Drugs move through food webs and can be dispersed into the riparian landscape! Even better, although we were unable to directly measure pharmaceutical concentrations in platypus and trout, we were able to use the concentrations found in bugs, combined with published food intake requirements to estimate what portion of human dose of certain drugs platypus and trout may be exposed to. We calculated that a platypus consuming insects from within the most impacted site that we studied would be exposed to half of a human daily dose of antidepressants. So, does that mean that the platypuses in Australia are all happy? It is possible that these human drugs are altering the behavior and the biology of the platypus? Studies show this happens to fish (Martin et al 2018, Brodin et al 2013), but as for platypus this question remains unanswered. 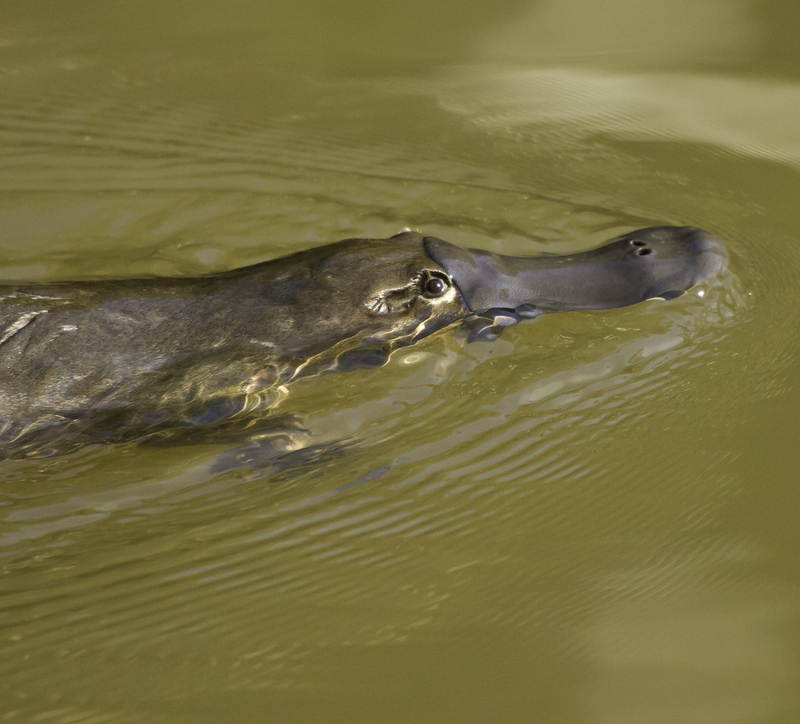 What does it mean to be a platypus living in and feeding on insects swimming in pharmaceutical pollution? As is often the outcome of scientific studies, many questions still remain. Our research makes it clear that pharmaceuticals are now moving though aquatic food webs and are capable of spreading to the terrestrial environment and it is becoming increasingly apparent that more research is needed to understand the fate of pharmaceuticals in the environment and what effects these drugs have on the animals and plants that live in or frequent aquatic environments. Erinn Richmond is a freshwater ecologist with a passion for aquatic insects and the streams and rivers they live in. Erinn completed her PhD in 2017 examining the ecological effects of pharmaceuticals and personal care products on aquatic ecosystems. During her PhD Erinn spent time abroad conducting experiments and working with scientist at the Cary Institute of Ecosystem Studies in NY USA. Erinn is currently a post-doctoral research fellow within the Water Studies Centre at Monash University, where she is continuing research on the ecological effects of pharmaceuticals and their uptake in food webs.